Note: Silent direction is given in enclosed italics. 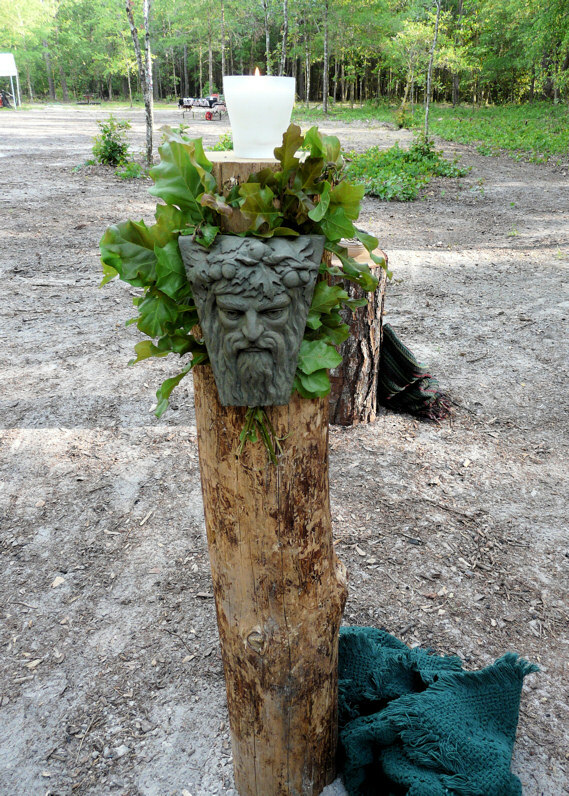 We welcome you to this rite of Beltane, for the _____ pagan community. With the blessings of Earth, Sea, and Sky may our ceremony begin! Let all disturbing thoughts be laid aside. (Cast circle sunwise) As this circle is cast, the enchantment of the apparent world fades away. We stand together in the eye of the sun here and now, between past and future. (Consecrate circle sunwise- pass water thru circle for pouring on ground) D: As water kisses the earth, so we bless our space. (Consecrate circle sunwise- pass incense thru circle) As the firey sun warms the air and quickens the earth, so we bless our space. 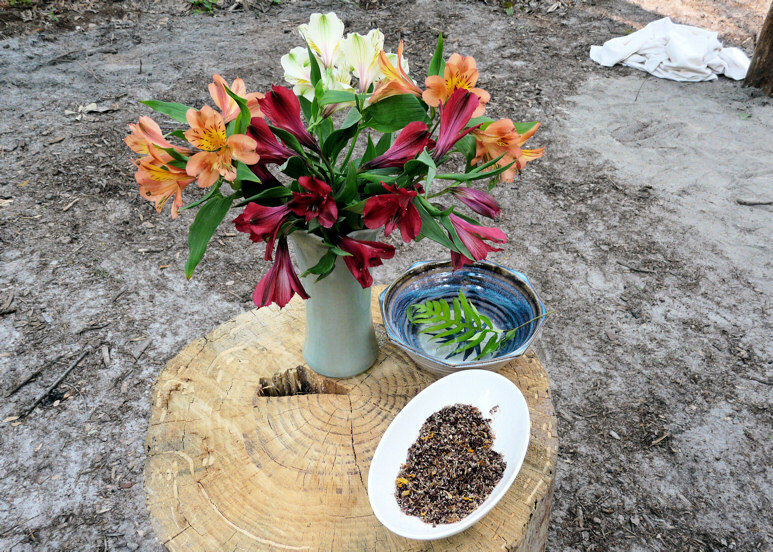 (Consecrate & bless circle with seeds) As this seed is spread let the blessings of water, earth, air and fire grow into new life. The earth below us, the heavens above us, and the trees around us. This is sacred time…This is sacred space. May the harmony of our circle be complete. Six months ago at Samhain we witnessed the start of winter and the death and decay that is part of the natural cycle of our lives. It was a liminal time, a time of thinning between realities, and a time when, along with the plants in winter, many of us pause to strengthen our roots for the growing season to come. 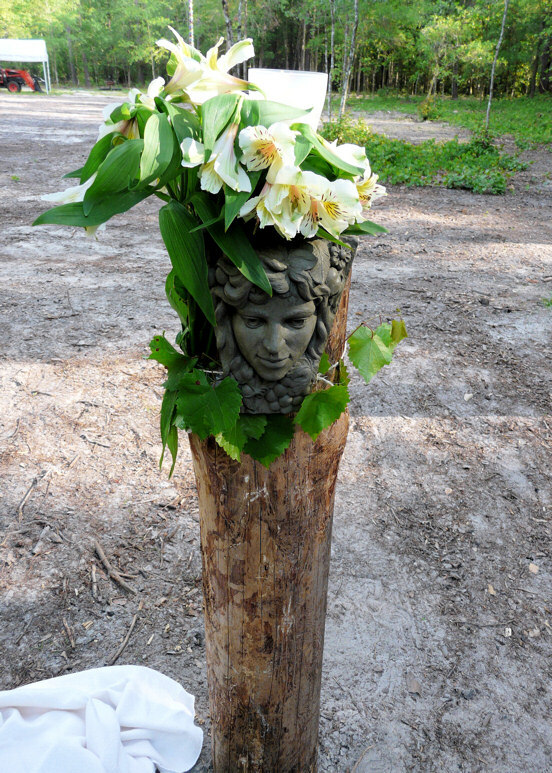 Now at Beltane we celebrate the start of the summer season; Spring is fully realized, and new life is all around us. This is also a time when the veils between worlds thin. We can look out to see the fair folk progressing through the countryside, and the spirits of the trees, plants, animals, and places. The primal forces of spring have many guises- such as the Goddesses Danu, or Isolde, or the Gods Belanus, or Cerunnos. (Go to Left pillar, uncover it, & light candle.) We bend towards the moon, and open ourselves to the Goddess within. (Go to the right pillar, uncover it, & light candle) We tend towards the sun, and open ourselves to the God within. Here burn the twin fires of Beltane. Man and woman; God and Goddess; Sky and Earth; each in each one of us. The Lady of the Land takes the hand of the Green Lord, and between the two fires of god and goddess, of woman and man, is created the Bright One, the Child of Light. Those who would, step forward now and pass through the Beltane Gate. Pass through the fires and be renewed! (Everyone files through gate and takes a stone from the bowl & then returns to their place) The stone you choose is a token of the blessings of the God and Goddess. Fill each with your prayer, and when the time is right, release this to the Universe by returning it to the Earth or Sea. (Once everyone is back in place) The divine union begets the Sun Child, the energy of creation. Let us welcome the flowering of the sacred within us, and pledge ourselves to cherish and nurture this bright child. We thank you for our lives on this earth and we ask, O spirit, for blessing on ourselves and our loved ones. Illuminate us from within. Fill us with the light of creation. Help us to radiate light upon the world by granting us the wisdom to use and direct the light always for good. We ask this in the name of the Sky Father, the Earth Mother, and the child of Light. It is time to return. As the light dies down let it be re-lit in our hearts. May our memories hold what the eye and ear have gained. May the harmony of the land be complete. May the blessings of the God and Goddess or Spirit be always with us. I declare this Beltane ceremony is closed in the apparent world. May its inspiration continue within our beings.